I have an old T1942 Tacx trainer that has a wired USB connection. To make it work, I wrote some code to convert the measurements (wattage, speed and cadence) from the Tacx Fortius to ANT+ format and transmit them out an ANT+ stick. It compiles and runs in Linux but you can run it in a VM or on a $10 Raspberry Pi Zero. So, you will need an extra ANT+ dongle (for a total of two) and either a VM (Virtualbox or VMWare player running Linux) or a Raspberry Pi. I plan to add a Raspberry Pi image complete with compiled code and auto start in the near future. A Canadian wheel builder with a fine balance of artistry and utility. Shows how to use the spoke tension app. Update to the spoke length calculator Quick Spoke is submitted. It has a new database of hubs and wheels, some layout and bug fixes and of course works with the latest iOS. As part of my new release I wanted to verify that my reading were accurate. I used a Park TM-1 in the past, but the precision on the TM-1 is in units of 10 kgf or more, and the accuracy of one that is several years old and has been tossed around in a tool box is suspect. 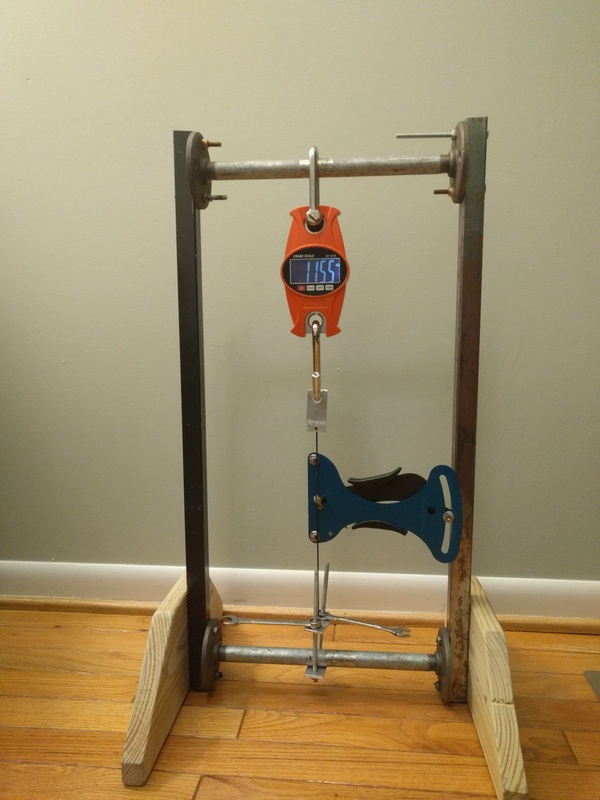 So I built a custom tension calibration rig. The idea is to measure the tension directly using a hanging scale, then use that to calibrate my app, and my TM-1 while I am at it. Here is the picture so you can see what I am talking about. First, with no tension on the spoke, the hanging scale is zeroed (tared). Then the spoke is tensioned to a set amount (115kgf in this case). The reading on the TM-1 should match, if not adjust the TM-1. In my case the TM-1 was off by about 10kfg. I adjusted and it matched the app much better than before. Overall a useful tool for a shop or anyone who is building large quantities of wheels.